A TASTEFULLY MODERNISED three bedroom 1960s semi-detached house with numerous CONTEMPORARY ENHANCEMENTS, attractively hard landscaped gardens and a sought after location within a MILE OF THE CITY CENTRE and Chester Meadows. A perennially popular location within easy reach of the facilities within Handbridge and Chester itself, Overleigh Road has long been regarded as a superb place to live, and the property itself has had the benefit of a tasteful scheme of enhancements and improvement by the present owner, which has resulted in a first class home. In addition, the property has an attractive front shrubbery garden, a hard landscaped rear garden, double glazed windows, a gas fired condensing combination central heating/hot water boiler, an RCD/circuit breaker controlled electrical system, connections to all mains services, and the following accommodation which is described in detail below. With uPVC/double glazed main entrance hall, radiator, central heating thermostat control, smoke alarm and useful understairs storage cupboard housing the gas and electricity meters, and the electricity circuit breaker control panel. With contemporary style white suite having chromium fittings comprising corner wash hand basin with tiled splashback, dual flush WC, wall mounted mirror and grain effect flooring. A very well proportioned reception room with dual aspect windows, two radiators, television point and coved ceilings. Very tastefully refitted with contemporary style fitted range of wall units, display units, floor cupboards and drawers with granite effect work surfaces, tiled splashbacks, grain effect flooring, composite single drainer sink unit with monobloc mixer tap, fitted four ring gas hob with stainless steel backplate and stainless steel/glass hood, electric oven/grill, integrated dishwasher, integrated washer/dryer, contemporary style vertical radiator, uPVC/double glazed rear external door, and points and space for a refrigerator/freezer. With staircase leading from the ground floor entrance hall, access to the loft space, smoke alarm and doorways to the following first floor rooms. With radiator and built-in double doored wardrobes with top storage cupboards. With radiator and built-in/recessed wardrobe with folding doors and top storage cupboards. With radiator, aspect to the rear towards the listed water tower, and recessed airing cupboard with slatted shelving and wall mounted gas fired condensing combination central heating/hot water boiler. With tastefully refitted contemporary style white suite having chromium fittings comprising panelled bath with shower curtain rail and side screen and fitted thermostatically controlled shower unit, wash hand basin with monobloc mixer tap, dual flush WC, radiator, shaver point, fan, mirrored medicine cabinet, overstairs storage cupboard, tiled walls and grain effect flooring. To the front of the property there is an attractive shrubbery garden with flagged pathway leading to the front door. Whilst to the rear there is a hard landscaped and earthed garden with boundary hedging and fencing, and flagged pathway and pebbled section. The house is a former Grosvenor Estates property built in approximately 1969 as part of a development for Estate employees, referred to as The Cobbles. Though freehold, the property is situated within a private estate owned and managed by Grosvenor Estates who are responsible for the roads and pavements. The Estate does not levy any service charge for this land. In addition to this, the property has the use of a lock-up store (numbered 9) within a brick building at the end of this site. This is also free of charges from the Estate. Garages at the other end of the site are available to rent from Grosvenor Estates subject to availability. 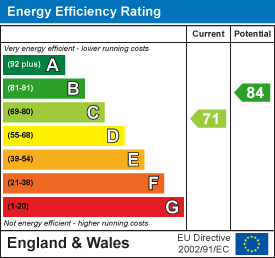 Cavity wall insulation was installed in 2008 and is covered by a 25 year warranty which is a contributory fact in the EPC rating C, having scored an efficiency rating of 71, 11 points above the national average of 60. The water is supplied by Severn Trent Water and is metered. 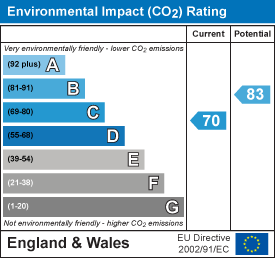 Gas and electricity is supplied by British Gas and Smart metering has been installed. From the Agents' offices, proceed down Lower Bridge Street, under the Bridgegate and over the Old Dee Bridge into Handbridge. Proceed up Handbridge and follow the road around to the right as it continues as Overleigh Road and proceed for a further short distance, after which the subject property will be observed in its position on the left hand side immediately adjacent to the entrance to The Cobbles.